Went on it last night (was as rusty as hell having not played it for so long, not that I was much good at it before!) Can confirm that there's nothing to download, all the Rivals stuff is accessible through the menus. The game should auto upgrade to Rivals this week, and downgrade by the end of it. No downloads needed You can do it in a night or two, it's not too long Why buy anything when you can just steal it for free? Clone Hero is piracy and not a valid alternative. Looks like I already downloaded it as the game title now says rock band 4 rivals. I’ve never paid for it or remember downloading it. Not sure how many people have both a DS and a guitar attachment for it these days (very little point playing this without one imo) but this specific game actually has a decent tracklist. Doubt you'll find it new for substantially less than a fiver. Haha cheers man, I know, I know. Have you tried Clone Hero? You could give that a go on PC, my friend is obsessed! Chin up, bro a) Its not cold, its 2.48 x boiling b) No-one is voting on your integrity. Whether you declare it or not, if its hard work to find it cools it a bit, at least for the less enthusiastic. Personally I need a guitar for the Oculus Rift version and I located one for the same price without the game for collection tomorrow - I don't want to say where as they wouldn't reserve and I don't want to get gazumped - but thanks for raising the deal. Because it seems to be a one-off.. Has anyone else been able to get one at this price? Shocked people still play this. That’s it just 5 songs Shame they can’t do all DLC FOR £1.19 for a week. 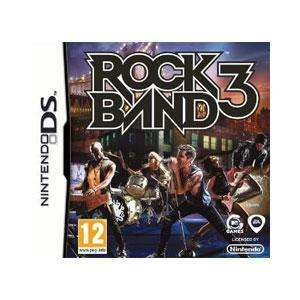 Love Rock band, just annoys me they never have a DLC sale. They had one which went on over a year when they stopped making DLC and it was only the first 1000 or so. Was nice picking up a ton of songs under a £1 and as its a game i will always go back to, I'll wait for the sales. In the centre of the store towards the tills. 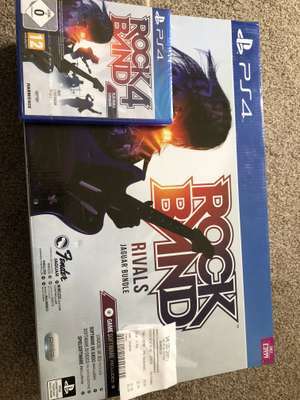 Just ordered the full band rivals bundle for £110. Having regrets now given I don't really want the drums! Teesside Park Game had about half a dozen of them on Saturday. Great value if you can find stock in your local store. The only way to check stock however would be to ask in store or call them as the listing has long been pulled from their website. That'll do for free, cheers! Already posted 5 days ago. Yes! Saw deal and crossed fingers and hoped Bang on can all-stars would be included and double whammy Honest Bob and the Factory-to-dealer incentives thrown in too.... I’m off to buy it immediately.... obciously after surgery to remove the tongue from my cheek. Worth underlining again that this doesn't work with wired guitar or drum controllers - ironic really, given most of them were! Never miss a 'Rock Band' deal again! It's showing on the XB1 music store but can't download at the moment. it's the 10th anniversary in a few weeks so there's a possibility of sales on the paid for songs. Yep. I have Black Magic and it's REALLY hard on guitar! Some difficult songs on the Mayhem Tour pack. "Does anyone still play this?" Every day. Heat added. I really loved his early albums but the last few....awful. Xbox One version for those that want it. Keeping my eye out for full band kit including drums on Xbox one. Had the Beatles kit for original Wii and is the only time I managed to get the mrs into gaming. Got guitar hero live but feels a bit too complicated when just wanting some fun. Annoyingly I've got like 1 or 2 songs from most packs already. Even cheaper in most other regions stores and good if you've a few Rubles or Reals sitting spare in your account. Is the build quality better than RB4 kit? Drums on mine were made of chocolate. Better off getting a set of PS3 rock band 2 drums and dongle off gumtree/ebay. Cheaper and much more durable IMO. Good price though if they fixed the problems from the original Rb4 kit. Looks like it's xbox. Good luck calling a store to try and reserve though, I just spent 15 minutes finding out that my local store has a couple in stock but theres no way to get through to the store. :( Game must be one of the worst companies for customer service. Better than GHL, online mode being added end of the month. The game is a lot more stable now than it was upon release last year, was a half baked unfinished bug ridden mess upon release. I've not played GH Live but the way Rock Band works is that it comes with a base set list of 65 or so songs (plus 12 added in a recent update for Rivals owners) and then there are almost 2000 additional tracks, with about 3 being released each week atm, available as DLC. For non-PS4 guitars it's done using the select button instead. They patched in the ability to use the dpad for PS4 guitars since the share button is where select used to be. Is this as bad as Guitar Hero for micro transactions (i.e. Forced to play rubbish songs / spend money before you can play decent ones)?